When Belgian entrepreneur, Bertrand Claeys, began talking about automatic swimming pool covers some 50 years ago, the swimming pool market thought his ideas were at the very least eccentric, responding with disbelief at such a preposterous notion. 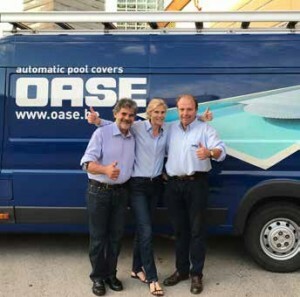 Some 50 years on and Oase automated pool covers are installed on an estimated 10,000 pools in 25 countries with export accounting for nearly 70%of the turnover. Working with companies like Piscines du Nord in Marcq-en-Baroeul (France) and BTU Pool Services in Woking the UK, Frédéric developed the company’s export side, reaching near European neighbours but gaining a following in countries as far away as Russia, Australia, China and the USA including a prestigious residential quarter project at Hong Kong’s The Peak development. By 1998, Oase had earned its international credentials. Constantly expanding activities required a more robust infrastructure so the offices and production facility relocated to extensive new headquarters in Proven, Belgium.